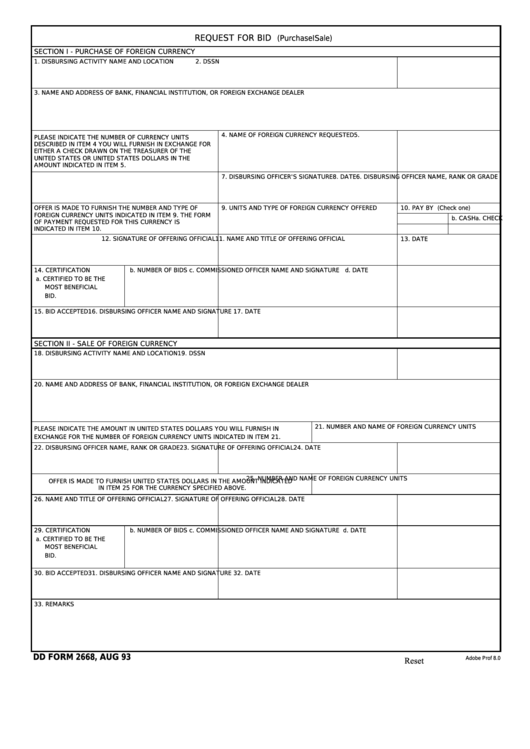 Download a blank fillable Dd Form 2668 - Request For Bid (Purchase Or Sale) in PDF format just by clicking the "DOWNLOAD PDF" button. Complete Dd Form 2668 - Request For Bid (Purchase Or Sale) with your personal data - all interactive fields are highlighted in places where you should type, access drop-down lists or select multiple-choice options. AMOUNT INDICATED IN ITEM 5. EXCHANGE FOR THE NUMBER OF FOREIGN CURRENCY UNITS INDICATED IN ITEM 21. IN ITEM 25 FOR THE CURRENCY SPECIFIED ABOVE.